Following the powdery mildew baseline review and promises of a ‘most wanted list‘, I thought it important to collate a list of host plants recorded to harbour this fungal pest here in the UK. A list of all PM species I have found in 2014 is now available on the Whiteknights biodiversity blog. Please take a look. Here is the presentation I delivered at the PM workshop, Kew on September 15th, 2014. 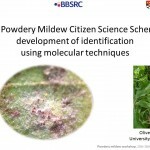 It was extremely different to the almost exclusively research-based presentations, but received much interest, avenues for future growth, and new powdery mildew samples. Never in my wildest dreams did I think such a thing could exist. Yet on Sunday 3rd August I will be travelling to Egerfood Regional Research Centre of Eszterházy Károly College in Eger, Hungary.